Last weekend was the finale of Wimpole Hall’s summer opening times with the Day into Night event. But what happens once the shutters are shut? Winter Clean! The staff in the Hall work frantically during the winter months, while the place is quiet, to deep clean all of the important items. Keeping the oldest and most valuable items clean, aids conservation and removes harmful substances. 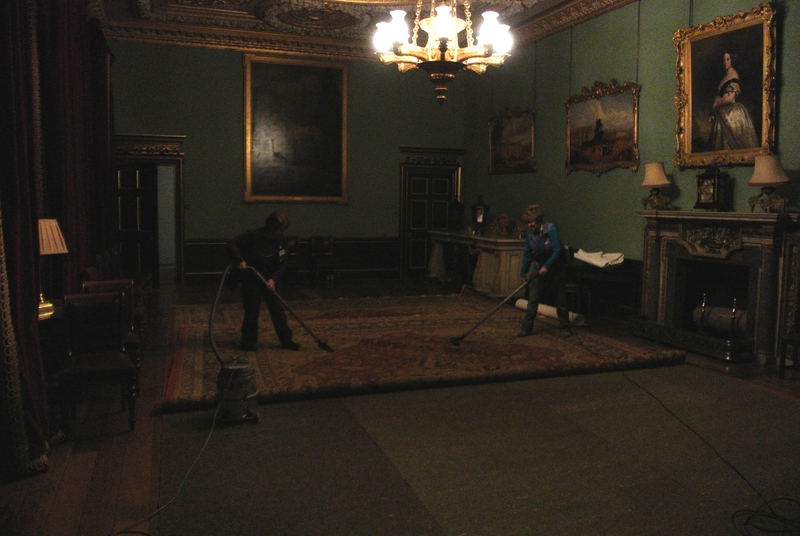 In the above picture Jean (left) and Val (right) get to work on the carpet in the Grand Dining Room. The huge table from the centre of the room has been removed and the carpet is carefully vacuumed on the top side, then gently flipped to do the underside too. The removal of dust from carpets like these slows down the disintegration of the fibers, and they last for longer. Any ideas how old the oldest carpet in Wimpole Hall is? It isn’t just the floors that get all the attention. 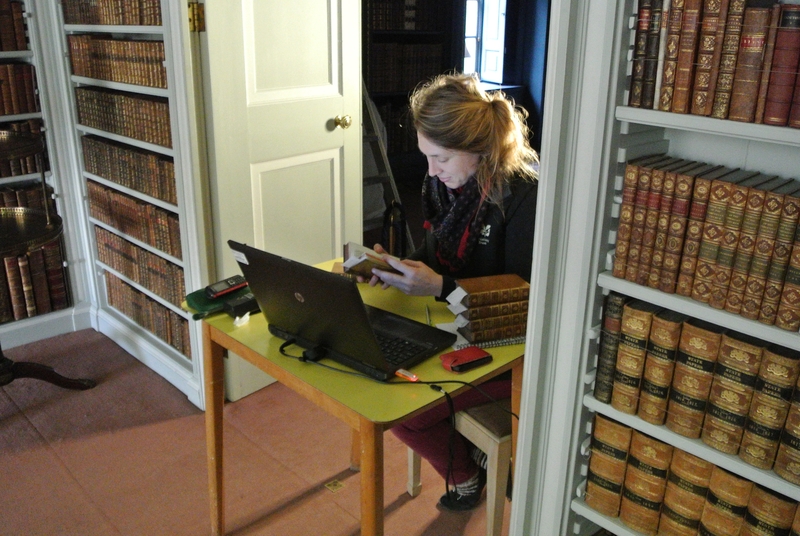 Here Jess, assistant House Steward, is carefully checking through the book collection for water stains. Since the leak in the roof a year ago, it is essential to check the books regularly and make sure they’re all clean and safe from damage. 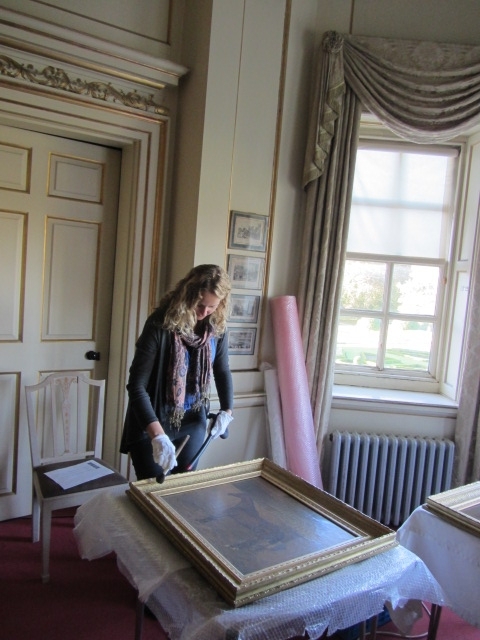 With the huge range of pictures here in Wimpole Hall, it is difficult to clean them as regularly as the annual Winter Clean would allow. But once every 3-5 years is the aim, to keep on top of them all. In the picture on the left, Lauren Papworth is using a flat Pony Hair brush to target all of the gathered dust. John Procter, on the right here, is also using a Pony Hair brush. 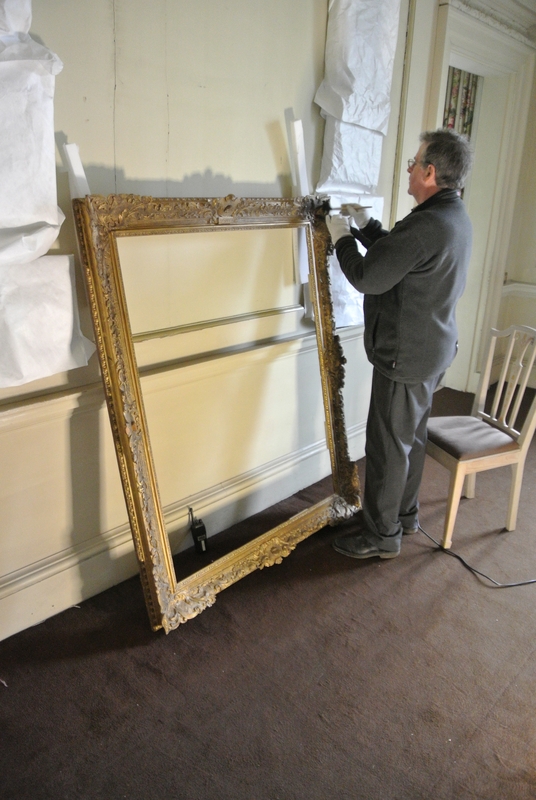 They are incredibly gentle and as he cleans dust off the gilt frame, the soft brush prevents the risk of delicate bits of frame falling off. The Winter Clean is thought of as ‘putting the house to bed’. 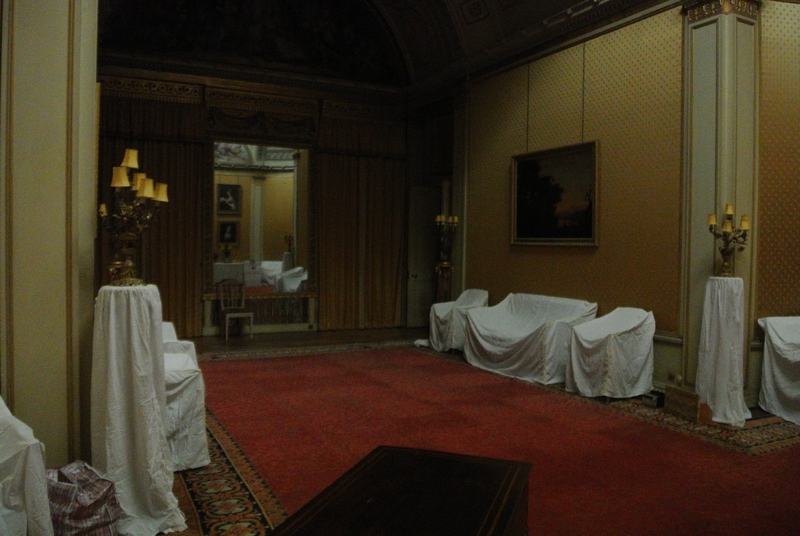 Here is the Yellow Drawing room with all of its most important items cleaned and then covered ready for the winter months. This is Mrs. Bambridge’s Bedroom, and it’s looking pretty different from how it usually does. Not only is the furniture from this room wrapped and ready, but it is also housing the items from both the Study and the Print Room too! The walk way in the foreground of the picture is providing clear space for access to the floorboards below. Not only that, but the green protective storage boxes are providing a perfect safety barrier for the important things beyond it. Just in case! So work for the re-cabling project continues and everyday, something new is going on. 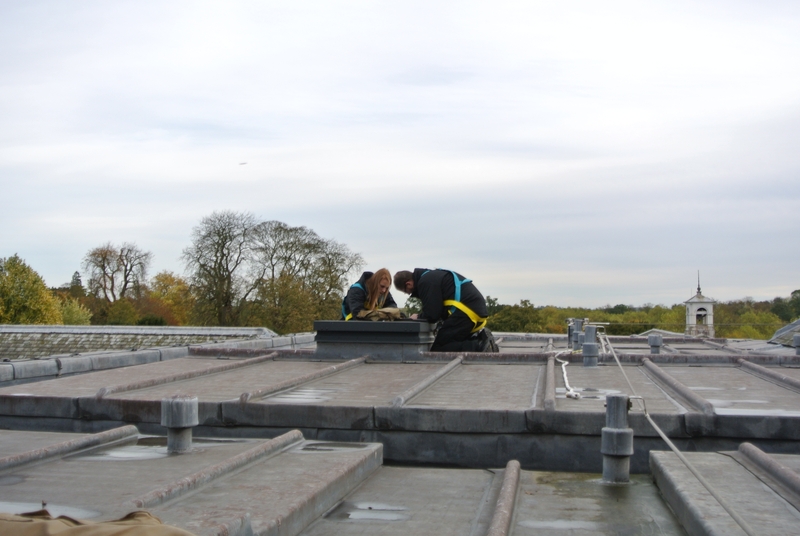 Yesterday morning at Wimpole the lock smiths were called out to open a hatch on the roof that has been locked (and key-less) for five years! Roof Hatch. Stable block Bell visible in the background. 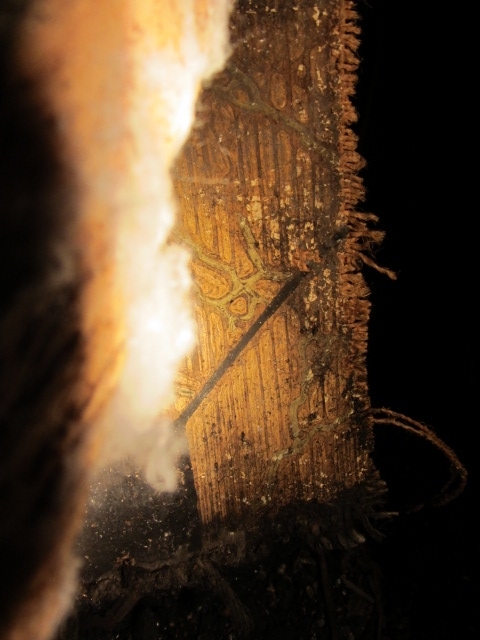 With the hatch finally open, the electricians were able to harness-up and explore the void below. And so the work continues! With the Hall being explored from new places, all kinds of things are being discoverd. Here, beneath the flooboards in one of the attic rooms, this nineteenth century lino was found hiding! 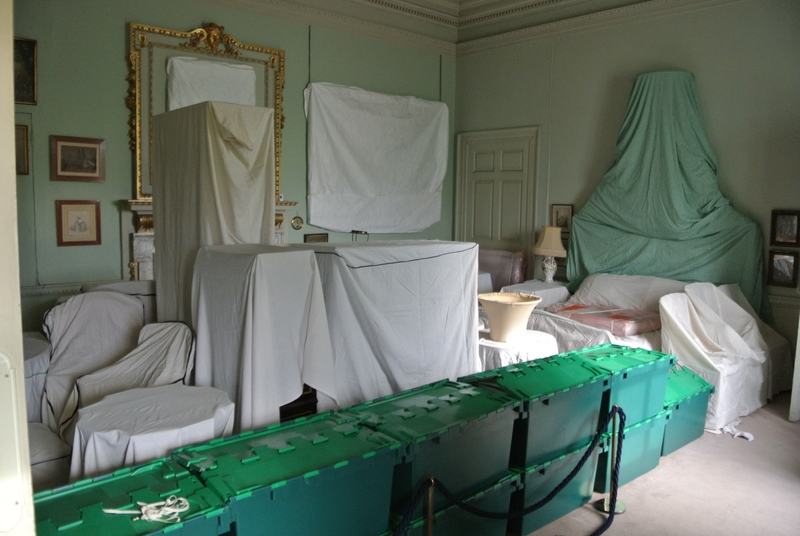 This entry was posted in Conservation, Mansion and tagged attics, cambridgeshire, collections, conservation, floorboards, hall, hidden, protected, wimpole, wrapped by luciackersNT. Bookmark the permalink. Fascinating insight and thanks for sharing.